Join us for a make and take workshop taught by craft blogger & pattern writer, "Crafty Staci" Staci Wendland. This 3 hour workshop will be SEW much fun!! 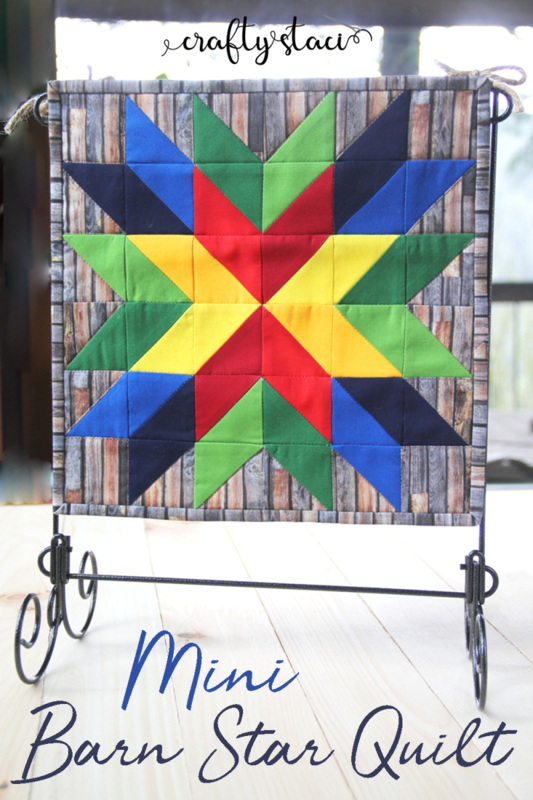 Barn Quilts are such a big thing these days so we are super excited to offer Staci's Mini Barn Star! No barn necessary! BRING YOUR FRIENDS FOR A FUN NIGHT OUT!! This workshop will likely sell out fast so sign up now! You'll have your choice of a couple different fabric collections that we will have cut or you can come in ahead of time and select from our fabrics on hand. You'll need to bring in your sewing machine, fabric requirements per workshop description, cutting mat, Fabric scissors, pins, thread, and a rotary cutter. Instructor Bio: Staci Wendland has a terrific crafting blog, one that I love to follow! She has a successful Etsy business which has lead to her becoming a pattern writer by popular demand. She is our workshop instructor and stands in for us at the shop when we are away.